Hello Lovelies! How's your summer going? I've missed you! Last weeks I told you about the major changes coming in my life. I'm super thrilled! But, I've been lacking in the inspiration for blogging lately! So, I wanted to give you a small look at what has been going on here the past few weeks! It has been incredibly hot here in the Netherlands. Hear me out, I'm from Georgia, but even I think that 85 degrees when you don't have AC in your home is way too hot! You see, AC is not a thing that most of us have here. In fact, a big advertisement for some restaurants is that they have AC! Normally, its fine. I mean I was wearing a jacket this time last year. But we are in a heat wave, which is so rare that I have found that maybe I do need more summer clothes. It's an interesting change, and I feel really bad for my long haired cat, Lulu. Speaking of Lulu, She is the queen of finding places to sleep. Sleeping on a wire clothes rack was her new favorite this week. Seriously, she is so weird! In other animal news, remember that cute little swan baby picture I posted a few weeks ago? The one peeking out from under his/her mom? Well those babies are growing fast! I've become so invested in their upbringing. Bird watching is a normal hobby for someone in their 20's right? Nope? Well I'm an old soul. We have been making a ton of changes to our apartment lately. Trying to make it feel more like a home and not like a dorm room. I have been saving for months to buy a new stove. Previously, we had a stove top and an oven the size of a microwave. This is what a lot of people have here, space is at a premium and appliances are expensive. You have no idea how happy I was when our new stove came in last week. However, and I have been told this is normal, it came without a plug! We have to hire an electrician to come and rewire it! So, while I have a beautiful new stove, I haven't been able to use it yet! Regrettably, we had to move the stove top as the stove needed to go into its place. Which means, if we can't cook it just in our tiny oven or in the deep fryer, we can't eat it. I think the electrician is coming this week. We also moved around all of our furniture in the main room. The space feels so much bigger now! We are still putting the finishing touches on it, but I'm finally starting to like our apartment. Its only been almost two years, but it is finally starting to feel like a home. Which is good, because we got a great deal on it, and we plan on living here until we have a significant down payment for a house. It's so funny, when we first moved, I would have given anything to move closer to the city. Now, I realized that I actually am a little bit country. Here is a sneak peak. 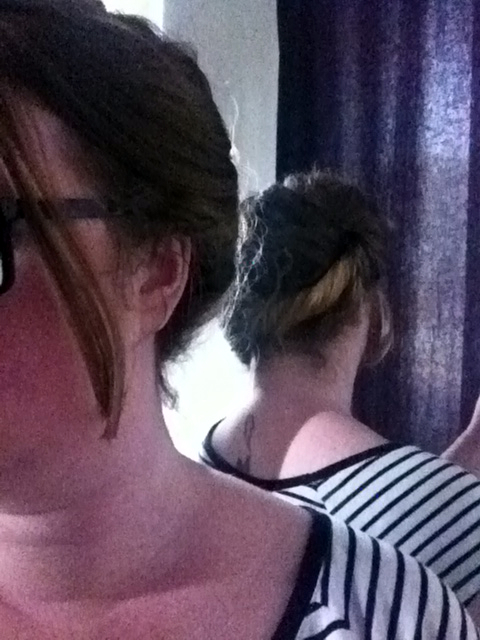 Lastly, I have been experimenting with my hair. I'm appalled to say that I haven't gotten my cut in a year. Before you get all judgy, I was bang butchered and I have been growing it out. Plus, let's just say that hair dressers here do not have the best reputation. Now that my hair is the longest it has ever been, I can try some fun updos. Like this one, which I loved, but fell out on my way to work. What has been going on in your lives lately? I want to hear all about it!